If there’s one thing I’ve learned about gardening, it’s that every garden is different. Each garden has its own unique combination of soil type, sun, shade, wind, shelter, climate, other plants growing nearby, indigenous populations of pests and beneficial insects…and more! All of these factors can change over time, too, so it’s no surprise that the use of certain ‘companion planting’ associations can work well in some gardens and not at all in others. A lot of companion planting combinations are based on, frankly, pretty flimsy evidence! Scientific trials do back up some techniques, however, and common sense prevails in others. To strip it right down to basics, companion planting means to grow two or more types of plants together for the benefit of at least one of them. Confusing or repelling pests is one of the main goals. Research carried out by Stan Finch and Rosemary Collier of Horticulture Research International in the UK has shed light on just what happens when pests enter a garden (or field of crops) and start searching for somewhere to lay their eggs. By monitoring several common pests of cabbage family plants including diamondback moths, cabbage white butterflies and cabbage root fly, they discovered that growing cabbages and other brassicas among clover resulted in fewer eggs being laid on the edible crop. This ranged from a 60% reduction in eggs laid by diamondback moths, to a more than 90% reduction for cabbage moths. The fascinating thing is that clover didn’t have any special properties that caused this reduction – exactly the same effect was achieved by using models of plants made of green card around the cabbage crop. These findings suggest that insects will land on any green surface in their quest for a plant that they can lay their eggs on or around. If they’re lucky enough to land several times on a plant that they know their developing larvae can eat, they will decide that this is a promising place to lay their eggs. If, however, they often land on plants that don’t interest them, they conclude that they’re wasting their time and will skedaddle to a more favourable location. So what does this mean for the gardener? Ultimately, it means that growing row upon row of a single type of crop in neatly-weeded bare soil can increase the chances of pest attacks simply because, once a pest is in the vicinity of your plants, they are more likely to land on the crop they’re looking for. 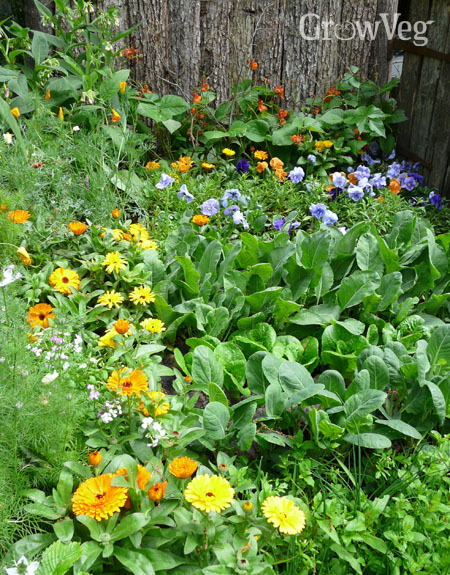 Companion planting with other green-leaved plants – whether clover, traditional companion planting favourites such as marigolds, other vegetables, or even (whisper it) weeds – can reduce the likelihood of pests landing on your crops. This could really make the difference between a good harvest and a non-existent one, particularly in larger gardens where protecting crops using barriers such as fleece or netting is less practical. Providing a green canopy over the soil has other benefits too. It will protect the soil from erosion, reduce evaporation in hot weather and help to attract a range of pest predators. Slug-eating ground beetles, for instance, like to lurk in groundcover and prey on any pests that linger around your crops, while hoverfly larvae will hoover up aphids after their parents have enjoyed the nectar of poached egg plant, alyssum and many other flowers. Of course, you do need to take care not to overwhelm growing edibles with nearby companion plants, particularly when your crops are still small, but there’s no need to leave wide strips of brown desert between rows of crops. Who wouldn’t prefer a lush cloak of greenery to bare brown soil? We’ve spent months analysing the evidence behind companion planting combinations, and our Garden Planner now includes a companion planting feature to help identify the best options for the crops you’re growing. Just add a plant you want to grow to your plan and click on the heart-shaped Companion Planting button. You’ll instantly see which plants can have a beneficial effect on your crop. So give companion planting a try – and let us know which combinations work well for you by posting a comment below! "Excellent! I have noticed two years running that if I plant Cavolo Nero (Italian Kale) next to the lavander bushes, that even if there are multitudes of Cabbage White butterflies (as we had this year) they hardly lay any eggs on the Cavolo leaves. In past years these plants have been ravaged by these caterpillars despite egg-exterminating every day on my part; just too many to find! I'm beginning to think the lavender must protect the Cavolo Nero, since the butterflies spend most of their time on the lavender flowers"
"Interesting! Distraction techniques at work perhaps? Great to hear that's working for you, thanks for sharing."